The Flybar 800 weighs 11+ lbs, approximately half of what the Flybar 1200 weighs, and is 30% less bulky than the Flybar 1200. Substantial height attainability of over 4 feet. Great for both boys, girls, men and women. Non skid rubber tip. One pin (quick) piston adjustment for 3 different settings. User friendly and easy to adjust. Flybar 800 test jumpers rave about how smooth and quiet the ride is, with substantially no or extremely low impact on their knees. By replacing the steel spring of a traditional pogo stick with a patented system of rubber spring elements, the pogo has been reinvented for the 21st century by the Flybar 800. This revolutionary, gravity-defying device can propel you four feet into the air, thanks to the eight heavy-gauge elastomer rubber "thruster" rods--which are specially formulated to stretch up to 300 percent. The spring system can be fine-tuned to reflect any jumper's skill level, body weight and goals. In addition to being a screaming good time, the Flybar 800 is also ideal for building balance, strength and endurance with a truly inspirational and challenging workout. Its body is constructed of high-strength, reinforced aluminum and it features sure-grip handlebars and foot pegs that let you stick every bounce perfectly. Designed for ages 12 and older, it supports riders from 80 to 180 pounds. Wear a helmet and use only with adult supervision. Choose to engage up to 12 rubber thrusters to determine the force of your bounce. The Flybar is equipped with 12 thrusters--the rubber rods anchored to the lower mount. The top end of each thruster is designed to be hooked--or "engaged"--onto the upper mount in order to power the Flybar. By choosing how many thrusters to engage, you determine the force of the Flybar bounce. It's recommended that you start by engaging one thruster per twenty pounds of weight (i.e., if you weigh 160 lbs., engage eight out of the 12 thrusters). If you engage too many thrusters for your weight/ability, you'll encounter too much resistance. If you engage too few, you'll be able to bottom out (i.e., push the foot pegs to the ground) without even tapping your full strength. The ideal setting should allow you to nearly bottom out while jumping with your full strength. Which Piston Length is Right for You? 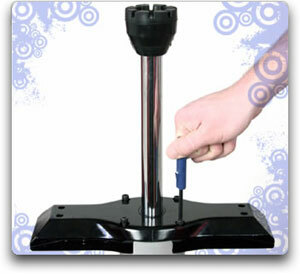 Quickly adjust the piston to achieve a peak bounce height. Piston Length can be set in nine positions, from seven inches to eighteen inches. Generally, the longer you set the piston, the higher you'll bounce. That's because most people can achieve a peak bounce height (measured from the foot-pegs to the ground) that's twice the piston length. In other words: if the piston is set at 12 inches, you'll end up with your feet 24 inches above the ground during a peak bounce. For novices, we recommend a shorter piston length for greater control, although even advanced users may prefer a shorter piston length for certain tricks or precision maneuvers. Since his first boyhood bounces on a pogo stick, pro skateboarder Andy Macdonald had a passion for the elevation, exhilaration, and pure fun that the pogo offered. Even though Andy went on to become the world's top-ranked skateboarder (a title he still holds today), he never lost the desire to revisit that rush he knew as a young boy on his pogo. However, no product substantial enough to support the weight, strength, and demands of a world-class athlete existed. So in the summer of 2000, Andy embarked on an effort to find a manufacturing partner that could deliver on his vision for this next-generation product. Pro skateboarder Andy Macdonald's boyhood dream leaps into reality. Irwin Arginsky, president of SBI Enterprises, had shared that same vision and goal but for an even longer time. 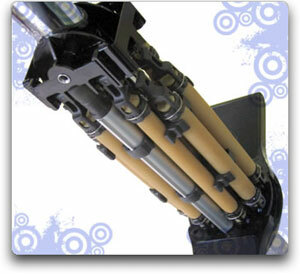 SBI Enterprises has been manufacturing pogo sticks since 1918 and developed a reputation as the industry leader. 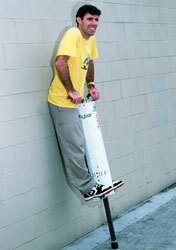 In fact, the company is the original holder of the Hansburg Pogo patents. Although SBI experienced steady success over the years, Mr. Arginsky continually searched for an opportunity to develop a product that would bring the "excitement of elevation" to a new level. It was this common quest for a product that could elevate adults as well as children to new levels and in new ways that ultimately led to the unlikely partnership between Andy Macdonald and SBI Enterprises. After countless meetings and false leads, Macdonald was about to abandon his quest, frustrated by the futility of his efforts to find a sporting goods manufacturer willing and able to develop this new product--until August 10, 2001. On that date, Macdonald spotted a story in The Wall Street Journal on the fad of newfangled pogos on the market, ones that included bells and whistles but lacked any new technology or capabilities. SBI's Irwin Arginsky was quoted in the article, making reference to a new technology that would revolutionize the concept of bouncing. Arginsky's goal: To create a new product category--not just a new fad. Macdonald quickly contacted Arginsky, who eagerly offered to share the beta prototype of a patented elastomeric spring system that was mobile like a pogo and could clear heights of over 5 feet, with a bounce that felt like a trampoline. After testing the system in a secret meeting with Arginsky in the shadow of the 2001 Gravity Games, Macdonald was convinced this was the real deal. A partnership was born as the two businessmen and visionaries agreed to collaborate in developing and marketing the product known today as the Flybar 1200 model. But there was much work to be done. With the market flooded at the time with pogo sticks that made promises they could not deliver, this team knew their product had to withstand the skeptics and truly earn respect. For three years, SBI and its development team of engineers, designers, and manufacturing experts collaborated with Macdonald to translate the patented system into a product capable of mass production and that met the exacting demands of Macdonald and Arginsky. After investing more than a million dollars and innumerable labor-hours, testing multiple prototypes, and resisting temptations to rush to market, the Flybar is now available in two models.